Lisa Comsatun from Harcourts Seven Stones is marketing this unique and very modern 5-bedroom leasehold villa for sale with roof top terrace in Umalas. The beautiful front side view showing a large pool and beautiful spacious rooms. Top view of the 100-square metre roof top terrace. 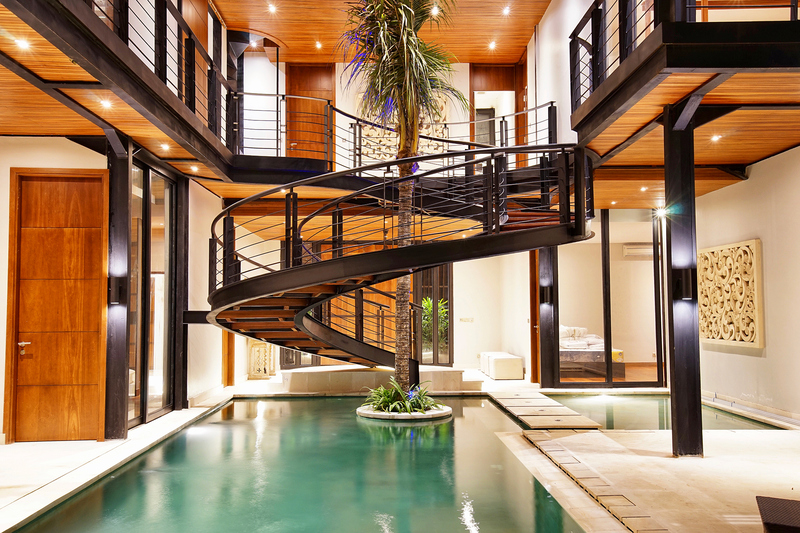 Night view of the large pool and a beautiful circular staircase leading to the first floor. Fantastic views of rice fields to the ocean from the roof top. This is a unique villa that stands out in a crowd. Set on 400-square metres of land, there are three bedrooms and the swimming pool on the ground floor, while the master bedroom and the junior bedroom are on the first floor along with the kitchen and indoor living area. The second floor has a 100-square metre roof top terrace, which has a bar, lounge, jaccuzi and BBQ area. Lisa Comsatun told WILLIAMS MEDIA "even though this property is very different from the normal villa here in Bali, it blends into the environment and has ocean views from the first and second floor. It will be ready for occupancy by the end of the year." Located in Umalas with easy access to Canggu and Seminyak, the villa is being sold with a leasehold title for 25-years with the opportunity to extend for a further 15-years at an already agreed upon price. To arrange a private inspection of this villa, phone or email Lisa Comsatun from Harcourst Seven Stones via the contact details below.